Joanne Marie Chiaverini was born on April 18, 1940 to Giovanni and Mary Chiaverini; she was the youngest of three children. Joanne’s father was born in Italy and after being abandoned by his father went to trade school in Naples. He became a skilled blacksmith and tool-and-die maker, starting a workshop in his hometown. Joanne’s mother was born in a coal mining camp in Colorado where, later, Joanne’s grandmother ran a boarding house for miners. After her grandfather’s death, Joanne’s mother went back to Italy and married Joanne’s father. Joanne was very proud of her Italian Heritage and had a life long interest in genealogy and family stories. She was proud of her Big Brother Roger known as the “Godfather of Western Michigan High School Football” (in the first group of the Coaches Hall of Fame) and her Big Sister Theresa Oehmke, who earned a doctorate in Math Education and developed teaching labs for struggling math students, a model used across the country. Joanne’s parents both worked hard to help settle new immigrants (finding the Italian store, Italian priest, and how to become a naturalized citizen). Her father protested the UAW not representing African American auto workers. That sense of caring beyond the family was deeply nurtured into Joanne. Joanne’s vocation was inspired by the IHM sisters at Holy Redeemer, Detroit, especially Sr. Vita Marie, IHM, Sr. Claire Elizabeth, IHM and Fr. John McCarthy, CSSR. When Joanne was given the name “Giovanni” her father’s name, at her profession her folks began to accept her call. For both Joanne’s 25th and 50th Jubilee celebrations her Bible quote was from Jeremiah: “Before I formed you in the womb I knew you, before you were born I dedicated you. To whomever I send you you will go”. A shrewd businesswoman, Joanne was with a dear friend Dr. Jack Stanzler and me in the old market in Jerusalem. Joanne exclaimed I need to buy some crosses for my family and friends. She began the dance of bargaining and Jack and I could see we were in the presence of a master. The merchant began with his price and she began with less than half. Then they began in earnest. “For you, for you… You think I am a hustler… you have mysterious eyes, you have beautiful eyes”. She countered with “but I need seven of these crosses, I’m a poor sister, etc.” Finally she sealed the deal and the 3 of us walked up the narrow street a block or two away. “Oh,” Joanne, said, “I forgot chains. I’ll get some in here.” We were way down from the original store; she selected seven chains and approached the counter; the same man jumped up to bargain with her – “I boss here, too,” he exclaimed – and they began all over again. As friend Art Swirtz once remarked – “Joanne has great ability to beg, borrow, and… make good use of her tax exempt status.” Nothing at the Prayer Center was ever paid for at the regular rate. “I’m never going home” and told stories of terrible daily beatings. “I saw God on your sign and need your help.” She offered to make chicken soup and fried balogna, Leroys favorite meal, but he wouldn’t eat. When Protective Services came, they raised his shirt and we saw his stripes. He knew his brothers and sisters had to be removed, too. He couldn’t eat till Joanne said, “Leroy – If I have to go to jail – I guarantee you will never go back in that house and we will get your brothers and sisters out, too.” Then he felt safe, ate his lunch and the worker came back with his siblings to take them to a safe home. 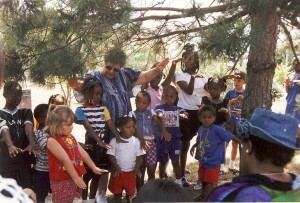 The St. Francis Prayer Center Joanne founded in 1974, was involved in environmental justice issues on the North Side of Flint where the poor were being environmentally abused. Hearings were in white suburbs. We agitated and finally got a hearing at Carpenter Road School but the hearing room was full of armed guards. She was a witness that the poor were treated differently (armed guards) in the hearings compared with middle class in suburbs (no armed guards). Joanne loved to have fun fishing, playing cards, enjoying children and doing crafts, and going to election headquarters where votes were counted to help her favorite candidates. Joanne, we are grateful that in 1845 Louis Florent Gillet and Mother Theresa Maxis founded the IHM order and that you answered your call in 1957. And we, from Flint are especially thankful that you served most of those years in the Flint Area. We thank you as our waitress, shepherdess, prophetess and anchoress. Joanne, IHM, Auntie Jo, Aunt Josie, Gio we commend you to the saints who dwell now in light eternal.